The Trixi mirror is made of impact-resistant acrylic. The Trixi mirror Ø 50 cm is also available as a variant with built-in heating element. This automatic heating prevents fogging or icing of the mirror. The Trixi mirror can be attached to both the wall and pipe posts (Ø 50-85mm) using the supplied bracket. 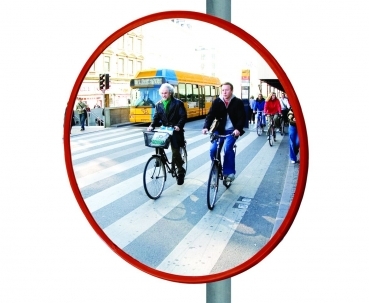 The Trixi Traffic Mirror has been specially developed for the safety of pedestrians and cyclists and provides optimal insight into the "blind spot". These road users are endangered due to the "blind spot" especially in crossroads and on pedestrian crossings and need an additional source of security. For the drivers it is possible to see the dangerous "blind spot" when turning off.